Daughter has just been on the phone as they are getting evacuated from her Uni office as they have found a suspicious package in the mail room. Bomb squad have just arrived. On the news just now. 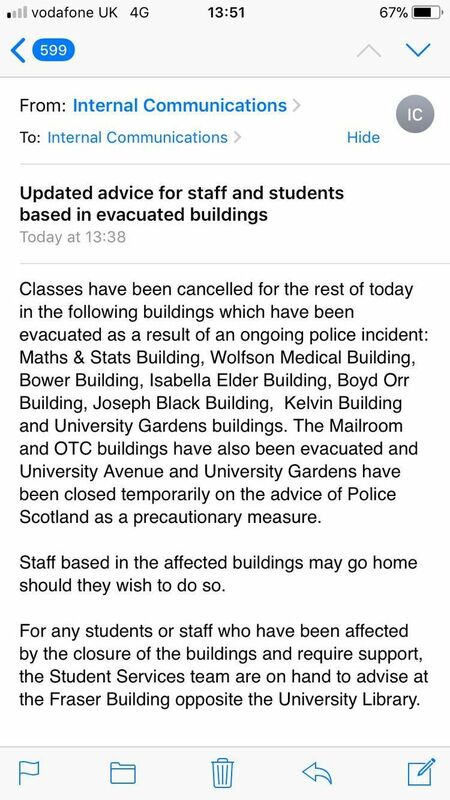 The police are starting to leave Glasgow uni but another one in Essex, WTF is going on? Bomb hoaxes are relatively easy and definitely low cost compared to using a drone at an airport. Send something that looks "wrong" and watch chaos ensue for a few hours. Easy. Package found in the mail room. Perhaps it could be relocated to a less vulnerable place? Academics are not known for being sensible. Always plan ahead - it wasn't raining when Noah started building the Ark. Before anyone gets touchy my daughter is down in that area too at Uni. Come to think of it if she misses track training tonight then someone will get a hoof in the nads 🤣 Its not the height of the fall but the sudden stop at the bottom that hurts! !